This item is 10 years and 5 months old; some content may no longer be current. An introduction to FRAX, a new WHO endorsed approach for the prevention of osteoporotic fractures. This article introduces a new approach to the prevention of osteoporotic fractures. Up to now the emphasis has been on trying to detect osteoporosis, at an early phase of the disease, in time to give effective therapy. However, osteoporotic fracture prevention is going through a quiet revolution regarding who to screen, who to test and who to treat. Underlying this change is a paradigm shift away from making a diagnosis of osteoporosis to a multi-factorial assessment of osteoporotic fracture risk. The model used for this is endorsed by WHO and is called FRAX. This change can be compared to the evolution in the approach to management of cardiovascular disease over the last 30 years. During this period there has been a shift of emphasis from the diagnosis of a disease, such as ischaemic heart disease, to the current approach to prevention which focuses on multi-factorial analysis of cardiovascular risk, with recommendations of lifestyle and therapeutic interventions depending on the severity of risk of an adverse event. Screening for and treating osteoporosis has, until recently, been the only way to try and reduce fragility fractures. Diagnosing osteoporosis requires assessment of bone mineral density (BMD) with a DEXA. There is a strong association between low BMD and fracture risk. However the majority of fragility fractures (in postmenopausal women) occur in those without osteoporosis (T-score <-2.5). For example the proportion of women aged 50 diagnosed with osteoporosis is about 5%, however approximately 20% will suffer from a fragility fracture in the next 10 years. It is apparent that measurement of BMD alone only captures a minority of the fracture risk. The cause of fragility fracture is increasingly recognised as multi-factorial, with risk factors that act independently of BMD and loss of bone with age. For example between the ages of 50-90 years the annual incidence of hip fracture would be expected to increase fourfold if based on age-related bone loss alone. But other risk factors make the actual increase closer to 30-fold. 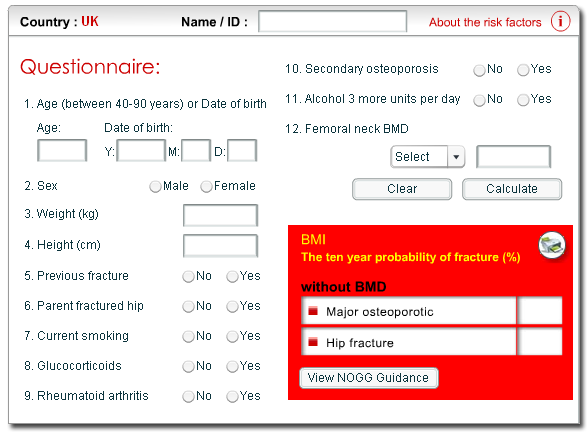 The WHO Collaborating Centre for Metabolic Bone Diseases at Sheffield has developed the FRAX tool to calculate the probability of an osteoporotic fracture based on a variety of established clinical risk factors, using either a body mass index (BMI) or a BMD T-score. The major advantage of FRAX is that it provides a better predictor of fragility fracture risk than BMD alone and hopefully will lead to significant reduction in osteoporotic fractures. The FRAX online calculator which is freely available at www.shef.ac.uk/FRAX (Figure 1) allows the calculation of an individual’s probability of a fragility fracture. The same calculator is used if BMD is not available. The BMD box is simply left blank. Risk tables (similar to cardiovascular risk tables) developed from the FRAX tool, are also available at the same site and have been included with this document as a reference tool. The online tool provides a more accurate estimate than the paper based tables as it gives weightings to the different clinical risk factors according their predictive strength. In general, smoking and alcohol are weak risk factors, glucocorticoid use and secondary causes of osteoporosis are moderate risk factors, and a prior fracture (in men) and a parental history of hip fracture are strong risk factors. The paper based risk tables don’t weight the risk factors instead an average probability is provided. Some clinical risk factors are so strong that even if the BMD is normal osteoporotic treatment is advised e.g. prior fragility fracture. The clinical risk factors for assessment of fragility fracture probability using FRAX are shown in Table 1 below. Using risk tables calculated using the FRAX tool, the probabilities of a fragility fracture can be estimated based on gender, age, BMI and the number of additional clinical risk factors. Note: additional clinical risk factors refers to those other than gender, age, and BMI. For example: a woman aged 60 with a BMI of 20 and two additional clinical risk factors would have a probability of a having major osteoporotic fracture of 15% in the next ten years. To assess an individual patient’s risk where there is a BMD measurement the probability of a fragility fracture is calculated as above except that the BMD T-score at the femoral neck is substituted for BMI. For example: a woman aged 70 with a BMD of -4 and two additional clinical risk factors would have a probability of a having major osteoporotic fracture of 54% in the next ten years. The use of FRAX does not exclude clinical judgement. Some patients at risk of fragility fracture can not be accurately assessed using the FRAX model, for example women with anorexia nervosa, and will need to be identified opportunistically. Intervention thresholds have been suggested by the National Osteoporosis Guideline Group (NOGG) for the UK. Where the risk has been estimated using BMD an intervention threshold has been suggested. This threshold is equivalent to that associated with a prior fracture, and therefore rises with age. Where the risk has been calculated using BMI an intermediate category (orange) is used indicating that probabilities lie on the border of the intervention threshold. The NOGG recommend that in this instance a BMD T-score is obtained to better characterise the risk. These intervention thresholds have been incorporated into risk tables in a similar way to the colour coding of the New Zealand cardiovascular risk tables. Orange denotes that probabilities lie between in an intermediate zone between reassurance and treatment and that a BMD should be considered to improve the estimate of fracture risk. Red denotes the fracture probability is consistently above the upper assessment threshold, irrespective of the mix of clinical risk factors, so that treatment can generally be strongly recommended. This is an example. For the full tables see the pull out section. The major advantage of FRAX is that it provides a better predictor of fragility fracture risk than BMD alone. Given the limited access to DEXA in NZ the FRAX tool offers a practical way for GPs to accurately assess a patient’s risk of fragility fracture. This provides the opportunity to reassure patients at low risk, and target the use of DEXA to those at high risk. Anisha Dubey said: 19/08/2016 11:31:20 a.m. This article is 10 years and 5 months old.